I'm down to only one M1-type rifle. I used to have a SA, Inc. M1A "loaded" with the s/s barrel, but I hardly ever shot the thing and sold it off last year. 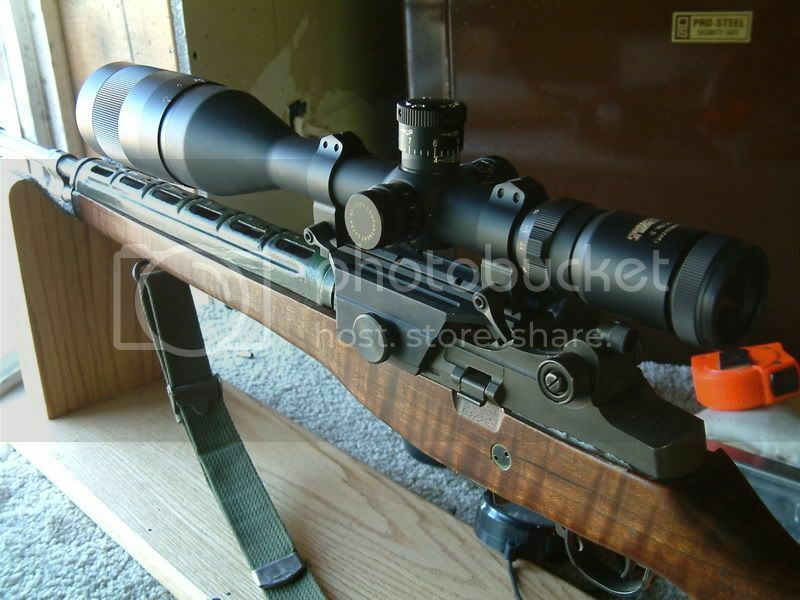 The remaining example I have is an M14 built by Dean at DGR. I sent Dean the HRA parts kit, birch stock from Fred's, and a Fulton receiver. Dean added a Barnett/Douglas medium weight barrel, reparked all the metal, finished the birch stock with his Type 2 finish (more of an unissued military look to it), gave the trigger group a NM job, put everything together and sent it back to me. It took about 6 months for the work to be done, but it was well worth the wait. Let's see what ya'll have, too! Last edited by halfmoa; 02-08-2009 at 05:07 PM. Yeah... that rifle looks a little familiar. I didn't recognize it with the warpaint on, but that last photo with the wood stock popped right out at me. It's an odd feeling, though. That M1A is the only firearm I've ever sold from my collection, but I'm supremely pleased that it's with someone who'll give it the range time it deserves. Yep that rifle is on a strict diet of 168 AMAX, it helps her keep that girlish figure, and I like a girl that looks good in jeans as well as a dress, so when she is out for varmits or hunting she wears the HMS Fiberglass stock, the stock is way cool, the guy that does them returns your stock to you with rails and forearm tension just like a bedding job without bedding it(he will also supply you a stock but the price goes up to cover the cost of the stock), and no flex in the forearm either, it really tightens up the groups and with GI stocks going for 80-90.00 these days, it did not seem to bad to have the rails and all done for 175.00, and she is still lighter than with the walnut on her. M14SA Federal Ordnance receiver, Winchester barrel and bolt, GI parts. I have the GI fiberglass stock as well, but just like the wood better. Also have a new in wrap 68 dated bayonet to go with. There is always room for another AK or 1911. As with anything car or gun related, your results may vary! "There has been a disturbing increase in things I know nothing about." Mr. Obama: I'll keep my freedom, hard earned cash, and my guns.... you Sir, can keep the Change! i made this cutout while i was "studying" in the library today. sorry DPOE, i know you love making your cutouts like this... but they just look nice. "For every minute, the future is becoming the past." Maybe the best rifle I ever owned. I've done a compliant conversion recently with it. Now, I'm on the prowl for GI mags and a Walnut stock!